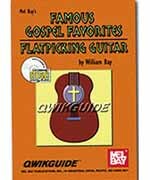 An early issue in Mel Bay's QWIKGUIDE series, this 5 1/2'x8' book offers 16 gospel melodies in standard notation and tablature with complete lyrics and suggested guitar chords. Each melody is preceded by diagrams of the chords needed to accompany the tune. Selections include: Precious Name; Heavenly Father; Lord, I'm Coming Home; Blessed Assurance; Leaning on the Everlasting Arms; Rock of Ages; Where He Leads Me; Jesus Calls Us; Precious Memories; I Need Thee Every Hour; The Solid Rock; Only Trust Him; Jesus Paid All; Here Comes Jesus; and I Have Decided to Follow Jesus. In this 90-minute DVD, rhythm guitar master Wyatt Rice teaches you how to greatly expand your rhythm guitar abilities by teaching: crosspicking rhythm; syncopated rhythm; a variety of right hand patterns combined with left hand technique to develop a "groove" rhythm; unique bass runs; passing chords; chord substitutions; and chord inversions. Additionally, Wyatt is shown improvisationally accompanying various instruments (banjo, fiddle, guitar, mandolin) and then analyzing what he has done to provide the rhythmic foundation behind each instrument.